The Baltimore Sun has released a cool interactive map showing Maryland’s results by precinct from the gubernatorial election. One major caution is that it only includes votes from election day, as we cannot currently allocate early and absentee votes back to precincts. Darker indicates higher density as well as a higher vote share, so it’s a bit tricky. While you need to go to the site to check votes for individual precincts, the screenshot above still shows some revealing patterns. Specifically, it appears that Gov. Larry Hogan carried large swaths of the county normally won easily by Democrats. Republicans usually do well in Laytonsville, Damascus, Clarksburg and Poolesville. On the western side of the county, Hogan also won in Potomac, Chevy Chase and much of Bethesda. The B-CC area is normally a Democratic bastion, so this is quite a shift. On the east side of the county, Republican support extended much further south than usual, including Olney, Colesville, Sandy Spring and portions of Burtonsville. Hogan also did well in much of Rockville. 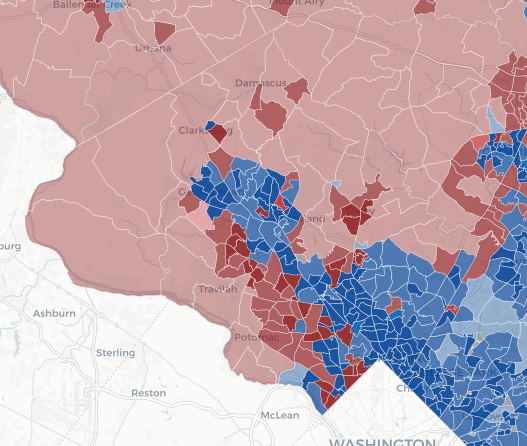 Of course, Hogan’s vote share was also up in the portions of the map colored blue. For example, Jealous carried the precinct including the Town of Kensington by just seven votes. In Silver Spring, Hogan won around one-third of the vote in the precincts I checked. In diehard Democratic Takoma Park, a quick scan of precincts suggests that Hogan scored in the 18-33% zone. In terms of state legislative districts, Hogan clearly won areas of the county encompassing Districts 14 and 15, as they appear uniformly red. It looks like he may have also carried District 16, as much of it is red and the blue areas were not usually won by Jealous by large margins. I’d also be curious to see the results for District 19. In heavily Democratic Montgomery, Hogan won an impressive 44.5%-an unheard of percentage for Republicans in this Democratic heartland. An impressive number of people must have cast ballots both for Larry Hogan and for Marc Elrich. While Prince George’s was Hogan’s worst county, he made his strongest gains there in picking up an additional 13.4% of the vote, suggesting that the Governor made strong gains in the African-American community. Ben Jealous also lost nearly one-third of the vote in Baltimore City. It was a strange night in Maryland. Republican Gov. Larry Hogan didn’t just win reelection. He crushed it, defeating Democrat Ben Jealous by 56.2% to 42.7%. This handsome 13.5% margin is stunning for a Republican in a state that went for Hillary Clinton by 26%. But Hogan’s rout was a personal, not a partisan, victory. The Governor had no coattails. Heck, he had anti-coattails as Democrats did very well below the top. Democratic AG Frosh and Comptroller Franchot won reelection by enormous margins. Results Tracker at https://tinyurl.com/ybtwqv4m has the latest for all the key races in the Senate, House of Delegates, and County Exec races. Check it out. Democrats narrowly lost two seats. Baltimore County District 42 was expected to fall to Republican Del. Chris West and did, though by a surprisingly small margin. Democratic Sen. Jim Mathias was always defying gravity on the Eastern Shore and finally fell to Republican Del. Mary Beth Carozza. But Democratic Sen. Kathy Klausmeier held on to beat back a challenge from Republican Del. Christian Miele in Baltimore County District 8. Democrat Sarah Elfreth held open Anne Arundel District 30 by a solid margin. In Frederick, Democratic Sen. Ron Young was thought to be in deep trouble but won reelection by his largest margin by far. Democrats scored an upset in Howard/Carroll District 9 where Republican Sen. Gail Bates appears to have narrowly lost to Democrat Katie Fry Hester, as Howard’s highly educated electorate turned hard against the Republicans. We’ll have to wait on absentees and provisionals but the absentees are unlikely to save Bates. While Democrats compose 39% of active registered voters, they comprise 51% of received absentees. The new Senate will have 32 Democrats and 15 Republicans. Last night was about making gains rather than staunching losses for Democrats. Not a single vulnerable Democrat lost. Instead, Democrats are poised to add five seven more seats to their already hefty majority. In Howard District 9B, incumbent Republican Robert Flanagan lost by 14 points to Democrat Courtney Watson, who returns to office after losing the 2014 county executive race. In Anne Arundel District 30A (Annapolis), Del. Herb McMillan’s retirement allowed Democrat Alice Cain to take the second seat and join seatmate Speaker Michael Busch in the House. Baltimore County District 8 will now send two instead of one Democrat to the House. Democrat Eric Bromwell won reelection and will be joined by Harry Bhandari. Republican Del. Joe Cluster lost his seat as Del. Joseph Boteler is the sole Republican. St. Mary’s County District 29B delivered a real surprise as incumbent Republican Del. Deb Rey lost to Democrat Brian Crosby, an army ranger who ran as a moderate or conservative Democrat. In Harford District 34A (Havre de Grace), it looks like incumbent Democratic Del. Mary Ann Lisanti will be joined by Steve Johnson, who currently leads incumbent Republican Del. Glen Glass by a whopping 25 votes. This one will go to absentees and provisionals. Among the received 583 absentee ballots, 271 (46%) were sent back by Democrats, 196 (34%) by Republicans and 116 (20%) by unaffiliated or minor party registrants. Among active registered voters, 49% are Democrats compared to 28% who are Republicans. Unlike in Senate District 9, the party affiliation of received ballots doesn’t send enough of a signal to suggest a clear winner, so we really will have to wait for the final count on this one. Two more surprise pickups: In Baltimore County District 42A, Democrat Michelle Guyton looks set to take the second of two delegate seats. She leads Tim Robinson by 306 votes. Meanwhile, in single-member Frederick County District 3B, Democrat Ken Kerr leads incumbent Republican Del. Bill Folden by 552 votes. Assuming the Democratic pickups in 3B, 34A, 42A holds up, the new House of Delegates will have 97 99 Democrats and 44 42 Republicans. Democrats had a really good night at the county level. In two upsets, Steuart Pittman took out incumbent County Exec. Steve Schuh in Anne Arundel, and former Councilmember Calvin Ball defeated incumbent Allen Kittleman in Howard. Ball becomes Howard’s first African-American county executive. Democrats also captured a majority on the Anne Arundel Council. Democratic County Executive Jan Gardner won reelection over Republican Del. Kathy Afzali in Frederick. In Baltimore County, former Del. Johnny Olszewski defeated Al Redmer by 15 points in what had been billed as a nailbiter. In Montgomery, Councilmember Marc Elrich easily dispatched not just Republican Robin Ficker but wayward Democratic Councilmember Nancy Floreen, who ran as an independent. State’s Attorney Angela Alsobrooks won the county executive race in Prince George’s without opposition. She becomes the first African-American woman county executive in Maryland. In Dorchester County, Democrats won one more seat on the county council, giving them a majority (as in Anne Arundel noted above). Democrats also won an additional council seat apiece in Talbot and Worcester, as well as two more in Wicomico. That gives Dems a net gain of 6 county legislative seats and a total of 52. Republicans are down to 73 from 79. Democrats retained control of all of the seats in Charles, Montgomery and Prince George’s, and held their majorities in Baltimore and Howard Counties. Republicans can take minor solace that they retained their one seat majority in Frederick and continue to hold all the seats in Carroll and Harford Counties. 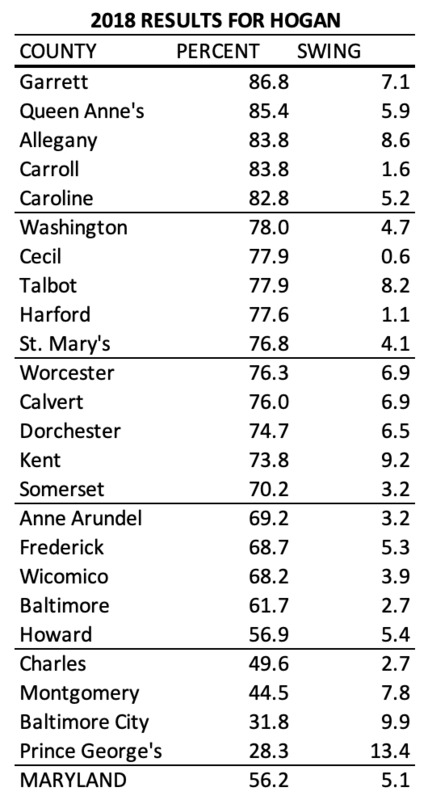 They also continue to rule in the vast majority of Maryland’s many more rural counties on the Eastern Shore, Western Maryland, as well as in Calvert and St, Mary’s. It’s Susie Turnbull’s birthday. 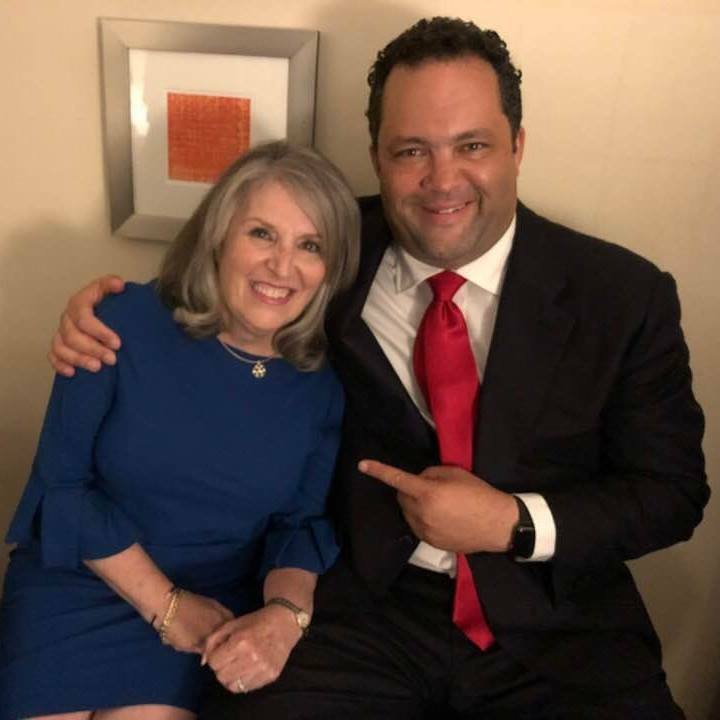 I bet the gift she’d like the most from her fellow Democrats is if you’d get yourself to the early voting polls and vote for Ben Jealous-Susan Turnball for Governor and Lieutenant Governor. Remember that, if you live in Montgomery County, you can find information on where to vote early and the wait times on the Board of Elections website. Regardless of your voting preferences, I hope you’ll take advantage of the right to vote. Gov. Larry Hogan has received plaudits for his willingness to utter any criticisms of Donald Trump’s grotesque behavior, in contrast to the lapdog approach that prevails among Republicans. Nevertheless, Hogan has been quite reluctant to criticize Trump and extremely strategic in both when and how he does it. Funnily enough, Hogan’s self-proclaimed laser-like focus on Maryland and reticence to attack the president or engage in national policy debates fell away when he opposed allowing Syrian refugees to be settled in Maryland when Barack Obama was president. Who knew that states set refugee policy? In contrast, Hogan had nothing to say on Trump’s Muslim ban because “it didn’t rise to the point where it was something I thought I should weigh in on” notwithstanding massive protests at BWI. Earlier this year, Hogan opposed the separation of kids from parents at the border when Trump’s reactionary immigration policy threatened to imperil his own political future. It’s not unusual that Hogan’s pique at having to comment on issues outside of Maryland melts away quickly when it suits his purposes. Taking time to campaign for Chris Christie in New Jersey and Ed Gillespie in Virginia sure wasn’t part of running Maryland. Hogan went out and stumped for Gillespie even as the campaign emulated Corey Stewart and went full Trump in its demagoguery. In contrast, Hogan had nothing to say about the Republican tax bill in Washington that ended the state and local tax deduction – a major hit on many of his Maryland constituents. Sure seems news of the weird when a Republican won’t attack Washington for raising taxes on his constituents. Even a cursory analysis reveals that Hogan’s gentle criticisms of Trump’s policies are often made without mentioning the president. Sstatements on Trump himself are usually calibrated carefully to appeal to Trump supporters even as he maintains his political viability in this heavily Democratic state. It’s classic Hogan, sound centrist but then immediately pivot to shore up the Trump base. Incredibly, Hogan also stated that “I can’t sit in judgment. Whether I like what’s going on, the people overwhelmingly elected him as president.” Overwhelmingly. Yes, Hogan has clearly spoken out more than most Republican politicians. But it has been only occasionally and grudgingly. He benefits enormously from grade inflation stemming from the supine posture of virtually all Republicans towards Donald Trump. When you think about the endless Republican efforts to somehow turn the tragedy in Benghazi into a crime by Hillary Clinton, their total lack of interest in any of Trump’s public violation of our laws and democratic norms is even more amazing. Gov. Larry Hogan has greater responsibility to speak up precisely because he is a Republican. It ought to be more reprehensible to him when a member of his own party acts abominably than a Democrat because it reflects on his party. Moreover, as a member of the same party, statements by Hogan against Trump’s routine breakage of presidential and democratic norms would carry more weight in our overly polarized era. Hogan has handled Trump very deftly from a political perspective. But political acumen is not the same as moral leadership.